Italy’s art squad, the Carabinieri Tutela Patrimonio Culturale, are the pre-eminent art police squad for a reason. Thieves hoping to steal this work learned that lesson the hard way last week when they attempted to steal this work of art from a baroque church (Chiesa di Santa Maria Maddalena) in Castelnuovo Magra in Liguria. Working from information that a theft was imminent, the Carabinieri and only a handful of the residents of the town orchestrated and elaborate switch. They swapped the real painting out for a copy, and that’s what the thieves stole. The thieves now have a near-worthless copy, and the painting is still safe in storage. Parish Priest Fr. Alessandro Chintaretto, who was reportedly napping nearby when the theft took place, expressed relief the original is safe: “It is a work of rare beauty which expresses a moment of profound faith . . . ”. Elisabetta Povoledo, Thieves Trying to Steal Precious Painting Get Worthless Copy, The New York Times, Mar. 326, 2019, https://www.nytimes.com/2019/03/14/arts/design/brueghel-crucifixion-painting-stolen.html. Nick Squires, The Italian Job: Thieves Steal Bruegel Masterpiece Only to Learn It Was a Copy Planted by Police, The Telegraph, Mar. 14, 2019, https://www.telegraph.co.uk/news/2019/03/14/italian-job-thieves-steal-bruegel-masterpiece-learn-copy-planted/. Thieves Steal A Famous Painting From An Italian Church — But Don’t Worry, It’s Fake, NPR.org, https://www.npr.org/2019/03/17/704257951/thieves-steal-a-famous-painting-from-an-italian-church-but-dont-worry-it-s-fake. Thieves steal fake €3m Bruegel masterpiece after police swap painting with copy, The Independent (Mar. 0, 2019), https://www.independent.co.uk/news/world/europe/bruegel-painting-theft-fake-church-police-italy-art-a8823151.html. Should Italy sell recovered antiquities? Author Derek FinchamPosted on March 26, 2015 Categories Antiquities, DeaccessionTags Carabinieri, Italy4 Comments on Should Italy sell recovered antiquities? Just a portion of the antiquities on display at the Terme di Diocleziano museum in Rome, Italy. 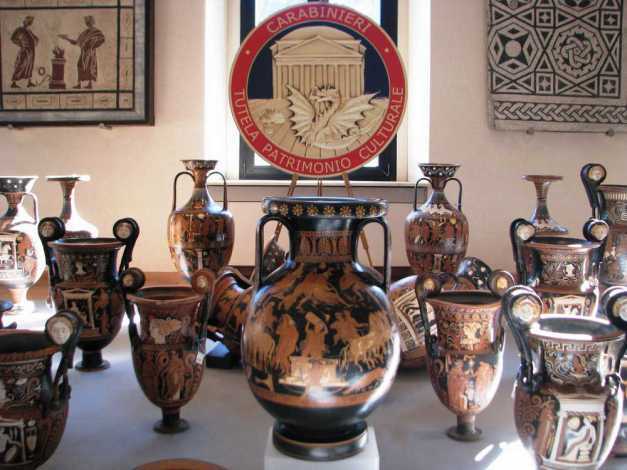 On Wednesday in Rome, Italian officials from the Carabinieri held a press conference to display a reported 5,361 objects recovered from the Swiss warehouses of Gianfranco Becchina. The staggering number of objects, many of which appear to be of museum-quality are disheartening to take in. How many tombs were ransacked? How much information lost? The objects were, as far as I can gather,were slated for sale internationally, and presented here we can see none of their history and context. Seeing these images, I’m struck both by the destructive nature of the international trade in antiquities, and also the inability of the Italian criminal justice system to respond to these crimes and prevent this kind of theft. If the Carabinieri’s art squad, which by most accounts is one of the best-trainded and best-funded art crime policing outfits in the world cannot stop a massive looting operation like this, what are other countries without such a squad left to learn from the investigation? What does this say about the efficacy of the current approach to looting? This press conference strikes me as yet another example of so-called “art on the table” events, though it is quite grander in its scope than the typical press conference. These objects would have been seized nearly a decade ago, with the alleged dealer behind this operation, Becchina, left uncharged, without any criminal consequences for these actions, other than it seems losing all of his illicit merchandise. Why were no charges brought? There is certainly a high degree of likelihood that these objects were looted, but do we know all of these objects are illicit? Would more creative and pragmatic solutions have a better chance than the aggressive but sporadic policing model which is employed to the art trade at present? The Chasing Aphrodite blog has the story of a noteworthy new federal forfeiture involving billionaire hedge-fund manager and buyer of antiquities, Michael Steinhardt. 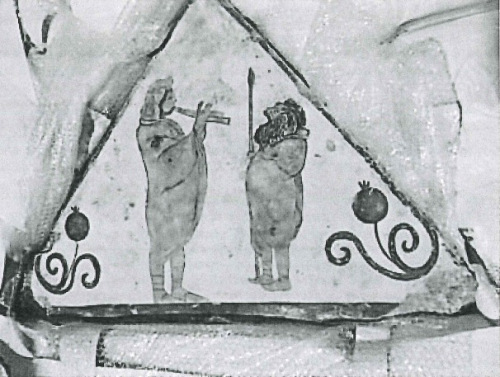 At issue is this lovely fresco allegedly looted from Paestum. The name Steinhardt will likely be a familiar one as he was a claimant who lost another federal forfeiture action over the Gold Phiale, which helped set useful precedents for federal prosecutors. The Federal prosecutor’s complaint alleges the importation of the fresco violated US customs law, §1595a, which prohibits the importation of objects contrary to law. The fresco was part of a FedEx shipment into Newark in 2011 that was detained by Customs and Border Protection. the shipment had a customs declaration form, but again, just like with the Godl Phiale case there appears to been misstatements on the customs form with respect to the country of origin for this object. The form declared the origin to be Macedonia, while the complaint alleges the fragment was taken from a tomb in Paestum. The provenance for the object claims that the fresco was acquired by Lens Tschanned from a Swis art gallery in 1959, and it had been in his home from then until April of 2011. The fresco had no export permissions. 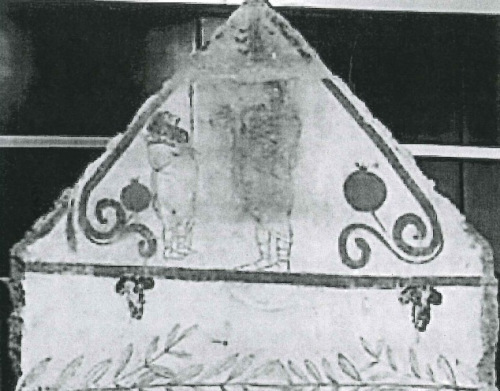 Customs and Border Protection contacted the Italian Carabinieri, and the Tutela Patrimonio Cultrale was able to identify the object as the pediment of a painted tomb north of Paestum in present-day Salerno. This site is known as the necropolis of Andriuolo. The complaint alleges that the figures on the fresco in question are painted in mirror image to another fresco from tomb 53 suggesting they may have likely been installed on different sides of the same tomb. Will Steinhardt litigate this dispute as aggressively as he did in the 1990’s with the Gold Phiale forfeiture? The Federal complaint makes an extremely compelling case that this fragment was looted from a tomb in Paestum. It’s connection to macedonia seems ludicrous when compared to the other pediment which was excavated and is on display at the museum there. Complaint, United States v. One Triangular Fresco Fragment, CV 136286 (S.D.N.Y. 2013). Steinhardt Redux: Feds Seize Fresco Looted from Italian World Heritage Site, Destined for New York Billionaire CHASING APHRODITE, Nov. 18, 2013. 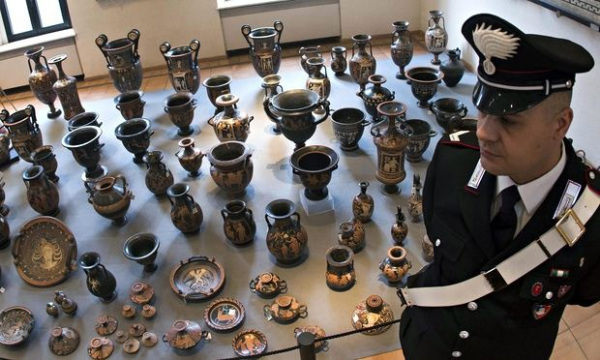 Over the Easter holiday weekend, thieves have broken into the Villa Giulia Museum in Rome, home to thousands of Etruscan artifacts, including the Euphronios/Sarpedon Krater. La Reppubblica reports today that the thieves broke into the museum on Saturday night through the back, locked the guards on duty in the gatehouse, and stole some jewelry from the 19th century Castellani collection. They appear to have avoided entirely the antiquities from Cerveteri, and elsewhere, many of which had been repatriated back to Italy in recent years. Holiday weekends are notorious for being risky times for museums. The thieves reportedly used smoke bombs to distract the guards and to obscure the view of the security cameras. But they appear to have taken little. Most of the antiquities were unscathed, at least according to initial reports. The Villa Giulia was founded in 1889 to house pre-Roman antiquities from the Etruscan civilization. The building had been a Renaissance villa built by Pope Julius III beginning in 1550. It has a lovely garden designed by Giorgio Vasari, and a very early 19th century recreation of an ancient Greek temple. Sono entrati dal retro e, dopo aver rinchiuso i custodi di turno nella guardiola, sono saliti nella Sala degli ori dove hanno fracassato tre vetrine e rubato alcuni gioielli ottocenteschi della collezione Castellani, usando dei fumogeni per non rendere visibili le immagini riprese dalle telecamere. Quello avvenuto la scorsa notte al Museo nazionale etrusco di Villa Giulia, a Roma, è un “furto singolare”, di cui “non si capisce la finalità” perché gli oggetti rubati non sono quelli di maggior valore nel museo, spiega la direttrice regionale per i Beni culturali e paesaggistici del Lazio, Federica Galloni. “I ladri – racconta la dirigente del Ministero dei Beni culturali – sono entrati dal retro del museo ieri sera, verso le 23.30. Hanno rinchiuso i custodi nella guardiola e sono saliti al secondo livello, nella sala degli Ori, dove hanno frantumato con un’ascia tre vetrine blindate molto spesse all’interno delle quali erano esposti dei gioielli della collezione Castellani. Ne hanno presi solo alcuni, forse perché disturbati dall’arrivo dei carabinieri, chiamati immediatamente dai custodi. Non capisco – ragiona Galloni -, è veramente un furto strano, singolare, perché nel museo ci sono dei reperti archeologici di gran lunga più importanti, che hanno maggior valore se immessi sul mercato”. Sul posto si trovano sia la scientifica che il Nucleo Tutela Patrimonio Culturale dei carabinieri. “Verranno esaminati i filmati delle telecamere a circuito chiuso”, aggiunge Galloni, anche se “i ladri hanno utilizzato dei fumogeni durante il furto”. “Roma, Rapina Con Fumogeni Rubati Gioielli Dell’800 a Villa Giulia – Roma – Repubblica.it.” Roma – La Repubblica. Mar. 31, 2013. Ulrich Boser has written a piece on the FBI Art Crime Team for the recent edition of the US News and World Report; it will also likely be a popular citation for law students composing student notes on art theft and cultural property crime for the next few years. The piece discusses the work of the FBI, and how the special art unit was instituted after the 2003 Iraq invasion. For contrast, consider that Italy’s Carabinieri has had a special Art Squad for 40 years. During the final days of the Civil War, Union Army soldiers stole North Carolina’s Bill of Rights out of the state Capitol. Commissioned by President George Washington, the document was one of only 14 copies created after Congress proposed the first amendments, and for more than 140 years, it remained missing. Then, in 2003, two antiques dealers tried to peddle the work for $4 million. A millionaire philanthropist showed interest in the document, claiming that he would buy the artifact on behalf of Philadelphia’s Constitution Center. But the philanthropist was actually an undercover FBI agent, and investigators seized the document. “It was like touching history,” one agent said. It is an interesting piece, but one that has been written many times, without adding much new for those like me who read these kinds of pieces.
. . . I described how museums and cultural institutions are often wary of reporting thefts as it can discourage other institutions and individuals from loaning works of art for special exhibitions – the cash cow for many institutions. To confirm my suspicions that special exhibitions are a source of considerable income I examined the 2006-2007 financial reports of several high-profile art museums. For example, the Philadelphia Museum of Art reported an income of $1,839,449 from special exhibitions. This amounted to a shade over 29% of the museum’s program service revenue ($6,281,637 – program service revenue is revenue from admissions, special exhibition ticket sales, concession sales etc., BUT not membership dues or government grants – usually the largest portions of an institution’s total revenue). Another institution, the Wadsworth Atheneum reported that in 2007 its income from special exhibitions was more than double its income from regular admissions ($842,218 versus $401,527 respectively). Although special exhibitions can be great sources of income for museums, they are also instrumental in sustaining and attracting donors and grants. Antiquities dealer Jerome Eisenberg has apparently agreed to return eight antiquities to Italy. Ariel David has an overview for the AP, complete with photos of all the objects. According to Ariel, “Eisenberg, who runs galleries in New York and London, said he bought most of the antiquities at auctions in the British capital in the 1980s, and decided to return them after Italian authorities recently turned up evidence that they were looted.” According to Giovanni Nistri, who leads the art squad of the Carabinieri “This is a dealer who since 1999 has returned of his own initiative other artifacts that came into his possession”. What is the significance of the return? It appears to be one of the only examples of a dealer voluntarily relinquishing allegedly illicitly-excavated antiquities. It seems the Italians had some kind of iron-clad proof that these objects had been wrongfully removed in some way. David Gill at Looting Matters argues this agreement to return objects is significant because “It is now clear that the Code of Ethics and the due diligence processes conducted by members of the IADAA are not rigorous enough.” I think he’s exactly right about the lack of effectiveness of Codes of Ethics, but this agreement has little to do with them. These objects were acquired at auctions, sometime in the 1980’s. The acquisition of these objects in the 1980’s doesn’t strike me as an accurate indicator of the current state of the antiquities trade, though it’s badly flawed to be sure. The more relevant point I think is how effectively the Italian Culture Ministry uses the press in painting a picture of a vast Italian repatriation campaign. An agreement seems to have been concluded months ago. Why is the story appearing now? It seems to be a calculated move. Seldom does a week go by that there is not news of an arrest, agreement for repatriation or the like. Italy and cultural property is in just about every news cycle. Believe it or not, public pressure like this is the single best tool a source nation has to secure the return of objects. This fact speaks volumes about the fatally flawed body of law which attempts to regulate the illicit antiquities trade. Italy is not using the law to seek these objects because it cannot; instead it is exerting tremendous public pressure on museums and individuals. “Italian police arrested 52 people and recovered several hundred smuggled archeological artifacts as part of their “tomb raider” investigation into international art theft. More than 300 carabinieri of the finance police and paramilitary art squad searched suspects’ homes in eight Italian provinces early today and found smuggled goods of “considerable worth,” Italy’s Culture Ministry said in an e-mail. The Bloomberg story got one important detail very wrong. It incorrectly stated that the Getty has agreed to return 52 antiquities to Italy. In fact, Italy demanded the return of 52 objects; the Getty has agreed to return 25 of them in principle, along with one other which was not on the list. The Malta Star has more on this story as well. It seems that many of the Sicilians arrested were not “from usual criminal backgrounds but rather from the professions and the business community and also include collectors and antiquarians.” If that’s true, it would be quite a blow to the antiquities trade. One difficulty the Italian authorities may have is following through with convictions of these individuals, who may be considered upstanding members of their community. From the Daily Mail, it seems Italian police have recovered 12 marble reliefs depicting Roman gladiators. USA Today picks up an AP story as well, available here. The panels were discovered buried in a garden near Fiano Romano. The reliefs, made of Carrara marble, are thought to date to the 1st century BC. The images are stunning, as David Nishimura rightly points out. Officials say the pieces will be studied, restored, and then displayed at the Villa Giulia in Rome. The Prosecutor, Paolo Ferri, says individuals have been charged, but their names have not been released. One thing I would like to know is, what archaeological context was destroyed in the process of removing this from the decorated tomb? How will the raiders be punished? I wonder as well, why the investigation took three years. That’s a very long time; I imagine they were waiting to catch the raiders trying to sell the pieces to a dealer or international buyer. News of yet another Italian victory in the struggle to combat the illicit art and antiquities market. Yesterday, Italian authorities announced that a cultural property trafficking ring has been uncovered. The two-year investigation centered on 35 individuals, and potential charges are likely to include both illegal possession as well as trafficking of archaeological artifacts. The recoveries include a renaissance still-life and marble altar pieces. The announcement evidences the continuing Italian efforts to combat the illicit trade in cultural property. The Italian efforts are garnering some impressive results, but one wonders if these efforts are just the tip of the iceberg, or represent a substantive blow to the illicit trade. Increasing the interdiction resources may be working, but I wonder if there are similarities between the cultural property black market and the illegal drug trade. Will other enterprising traffickers step in? I fear that they will, and the only real substantive change must be effected at the other end of the market, where the purchases take place.